Tale of Three Forts - Ghumakkar - Inspiring travel experiences. The bright sun kissed land of Rajasthan, inviting from the pages of travel magazines and aggressive glossy ad pages of travel agencies has been an ultimate destination for Indians as well as foreigners for many years now. And how evident it was from the flocks of foreign tourists seen at almost all tourist places, historical or religious and also from the marked up prices of local goods in the posh air conditioned showrooms of Udaipur and Jodhpur. But then we live in a world where memories are commodities. However Rajputana, the name given by British, is not just a tourist destination, it is a thriving cultural legacy and an experience which makes you fall in love with this land. Rajasthan is land of colorful Aravali mountains, land of brave Rajputs fighting for centuries against the attacking armies from north west, land of Hindusthani art and architecture and more importantly land of heritage which is still part of people’s lives. This is the land that river Saraswati skirted around to flow into Arabian sea. This is the land of Matsya, part of Malav country from great Mahajanpadas of ancient India. This is where the militant tribes of Yaudheya and Arjunayan fought against the onslaught of Shaka, Kushan and Huns. This is the land which coloured these foreigners into the very own color of this soil and merged them into mainstream like milk and sugar. This is the land of western Kshatrapas and Gurjar Pratihar who built grea empires and fought for them. This is land where several major Rajput clans such as Rathod, Chauhan, Parmar, Solanki and Sisodiya rose to power and continued to wield their authority for ages . Geographically Rajasthan is split into 2 major divisions. Generally speaking, the east and south is green and leafy valleys of Mewar whereas west and north is part of Thar, the great Indian desert. Our journey started in Udaipur, Mewar, took us to Jodhpur , the gateway to Thar and back to Udaipur. And what could be a better start of this fort and temple trail than the Fort of Chittaurgarh, epitome of Mewar Rajput pride! Anchored on Rajput soil for more than 1400 years it reminds us of Rajput valor and sacrifices. As we moved effortlessly on Udaipur-Chittaur national highway flanked by mustard fields, suddenly the flat horizon gave way to another range of Aravali mountains. While finding out way from busy Chittaur roads, the fort just appeared, a mighty royal presence, capital of Sisodiya Rajputs and sole objective of Maharana Pratap’s life. Climb to the top passes through fort walls and crosses first 3 ‘pol’ or gates. Chittaur Garh is large in its expanse and houses several temples, palaces, lakes and ruins. Chittaur Garh built by Chitrangad Maurya stood erect for several centuries until Akbar captured it finally in 1567 AD. Each step , each wall a mute spectator to lives of personalities larger than life themselves. This is the place where Maharani Padmini walked into fire to protect her womanly pride. This is the place where Meera lost her soul and body in her Giridhar Gopal, This is the place where Rana Kumbha returned victorious from his battle against Sultan of Gujarat and erected the marvelous Vijay Stambh as a memorial. This is the place when captured by Mughals, became a life objective for Maharana Pratap who wanted to see it free and back with Rajputs. It is not difficult to get awed by the importance of this place in Indian history..
From Meera Mandir, a very ornate and classic example of Nagar style to the Samadhishwar mandir with three faces of Shiv, The green deep waters of Gaukund to island palace of Padmini now surrounded by age old moss and a pond bounded by craggy Aravalian rocks and then the most beautiful and towering Vijay Stambh, deeply carved in yellow sandstone, challenging the blue sky above! Chittaur was a trip to history lane. It had mesmerizing and touching tales to tell for those who wanted to listen. But unfortunately Chittaur fort was crowded with people who wanted to have some fun by jumping in and out of Vijay Stambh windows and run around whistling and laughing on the steps leading to temples and monuments. 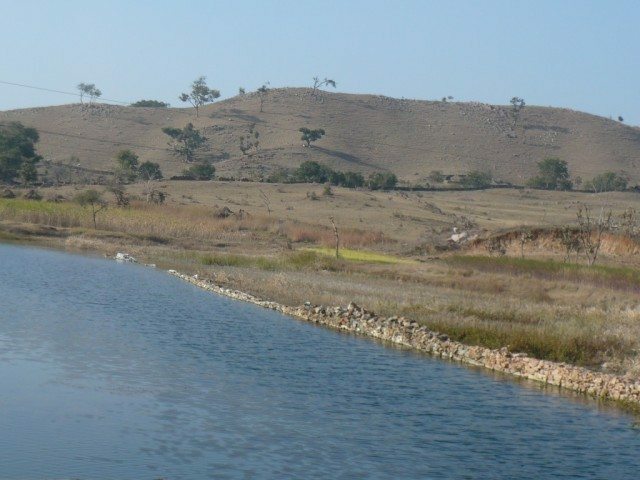 Before venturing into land of sands, one more important attraction waited for us, in silent valleys of Mewar Aravalis, overlooking a clear blue pond and under the bluest of the blue skies. 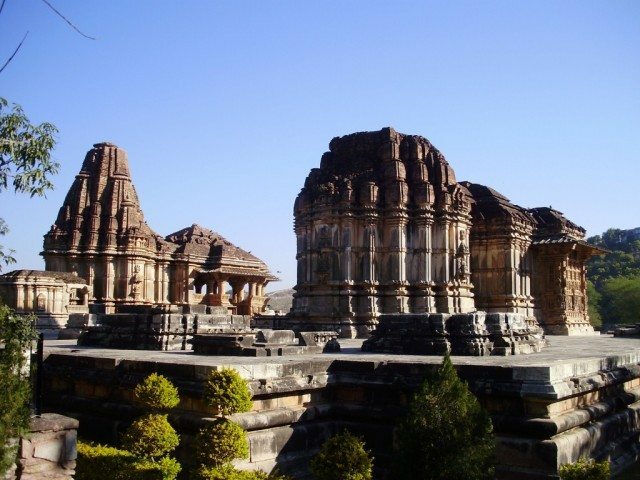 The twin temples of Nagada, known as ‘saas-bahu’ temple is a hidden gem. Saas Bahu is certainly colloquial for ‘Sahastrabahu’ as in the case of Gwalior ‘saas –Bahu’ temple. These temples are built on high plinth and boast of intricate carvings and a very elaborate grand doorway marking the boundry of both the temples. The temple idols are gone so no clue as to which deity the temple belongs to. The guide/care taker was a forlorn old man more interested in not talking to us. This could be a Vishnu temple and adjoining one may belong to Laxmi, however these are just guesses. The guidebook places this temple in 9-10’th century AD built during Gurjar–Pratihar times. 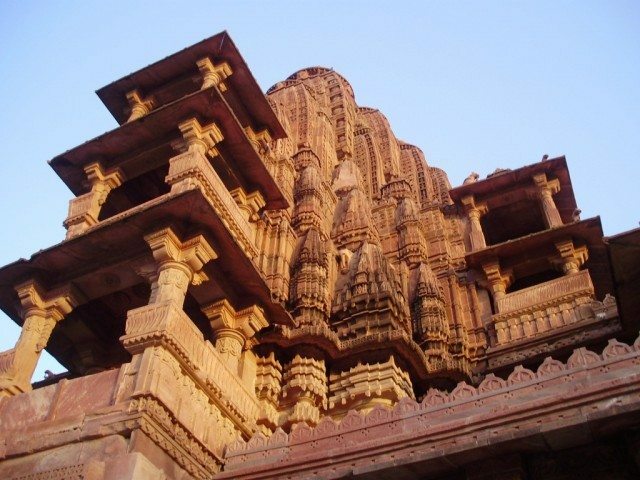 The temples are really an exquisite piece of art in red sandstone. It was a feast to eyes with walls panels, the roof and columns, everything adorned with beautiful human figures or artistic designs, not to forget the deeply carved ‘Makar toran’ inside the temples. Middle of the premise, there is a big ‘shivlinga’ as well, The gateway facing east has 3 sections, later seen in most of the palaces of Rajasthan. This temple although on a busy tourist route is hardly visited by the usual tourists who flock to Nathdwara and Eklingaji. 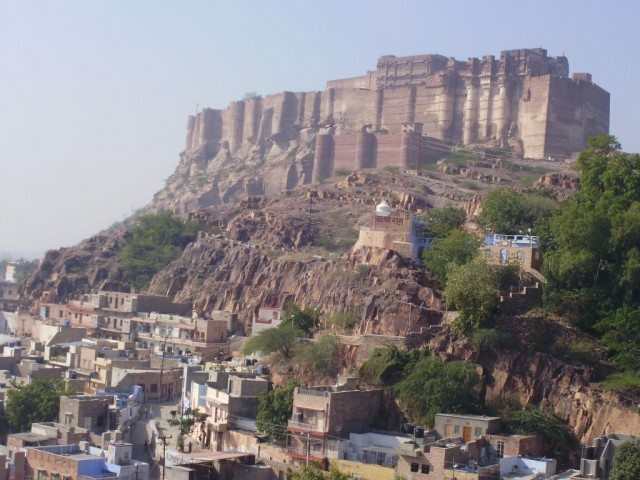 The next fort which literally won us with it’s grandeur was Mehrangarh of Jodhpur. Journey from Chittaur to Jodhpur took us from one plain to another only interrupted by series of Aravali mountains. Aravali range is the oldest mountain range in Indian subcontinent covering most of Rajasthan from north east to southwest. Mineral richness of Rajasthan soil is evident in pink, red and yellow shades of sandstone and other rocks glowing in bright sun in the lap of Aravali. As we left the fertile and green land of Mewar , landscape changed gradually. It became more arid with shrubs dotting on flat stretches of white soil. Vast riverbeds, all dry , sand mixed with stardust, a hillock springing suddenly from ground, shades of pink,yellow, beige splashed across the rocks , stone fences marking the boundaries for miles. The setting orange sun in the west, a lone camel, troup of lambs returning home finding way from dusty bushes reminding us that we are on threshold of Marvad, land of colours and sand dunes. Jodhpur, a city of solid sandstones gave a distinct feeling of being in a very different country. The golden wall of the city rampart running parallel to horizon, massive and impressive Ummaid Bhavan Palace sitting pretty on hillock and Mehrangarh fort protecting the west side, roads flowing with ghagara clad women with nose rings, turbaned heads of sharp nosed marvadi men, a lone pathan cycling into crowd, the funny looking rickshaws with their names painted on top of windshield.. It is city which can still take you back hundreds of years mentally even though you are standing on a tarred road lined with cement buildings. 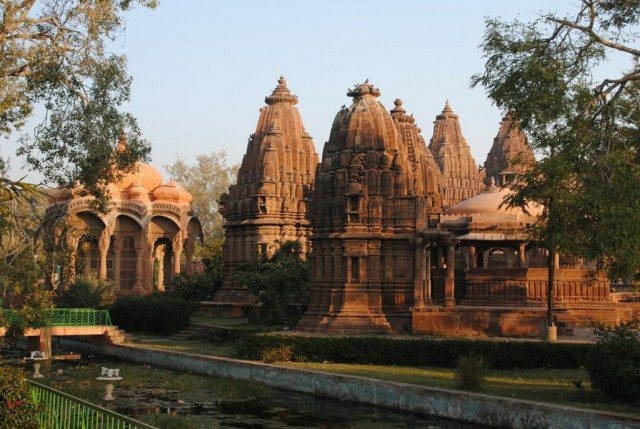 Another treasure trove of Jodhpur is Mandore garden temples. 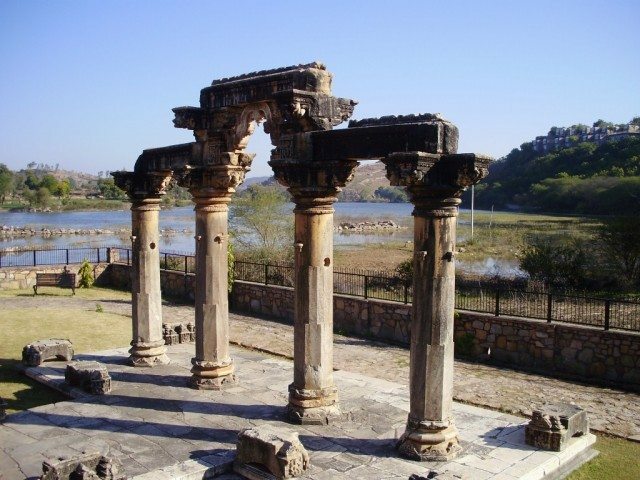 Mandore is old Mandavyapur, the previous capital of the region. 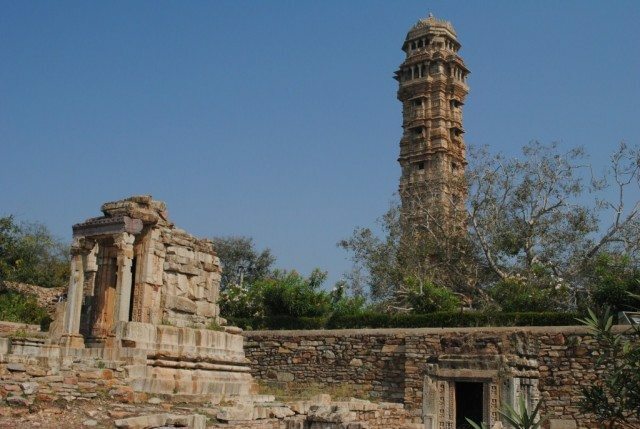 This place is steeped in history as it has a hill fort dating back to start of the millennium, Jain vihar and temples which can be placed around 4’the century AD and later ‘chhatri’ or Deval of several Rathod kings of Jodhpur built in 16’th century AD. Not to the forget, the wonderfully laid out garden with water terraces and lovely walkways. It could be one great destination if maintained properly. Heap of plastic bottles and garbage all around saddened my mind, as we were walking towards the temple cluster hidden behind large green trees. These temples are supposedly the chhatri’s or Deval which is equivalent to a cenotaph. However i was intrigued by the size and grandeur of these typical Nagar style temples built in lovely shade of red sandstone. The biggest one could easily compare with Khajuraho temples. The temples were complete with all components of a temple architecture, in fact one of them even had a rare inner sanctum which had a ‘pradakshnina-marg’ of it’s own. The outside carvings were outstanding as were the inner roof of the temples which were high and adorned with beautiful carvings. In addition to the temples, there were several dome like structures which were definitely ‘chatris’ or samadhis. However I could not understand the reason for these temples to be treated as ‘deval’ or ‘samadhi’. Of course there were no idols in any of these temples. But to treat such massive work of art which is a complete temple in all it’s glory as mere cenotaphs looked like a cruel justice. The last but not the least, and truly a fitting finale to the fort trail was the robust, massive Kumbhalgarg. 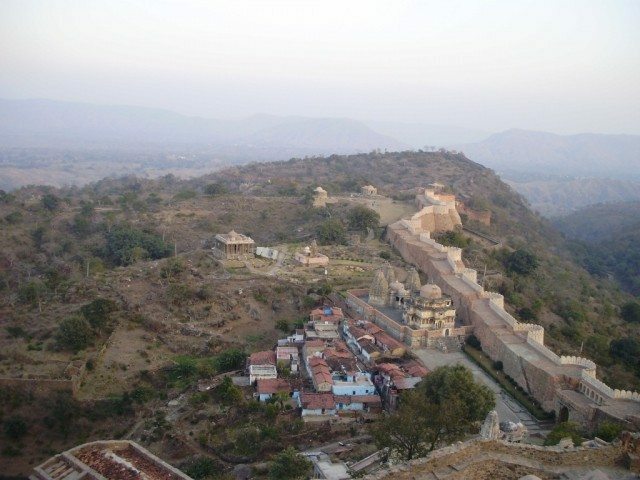 Built by Rana Kumbha this fort has the fortune of being the birthplace of Maharana Pratap. 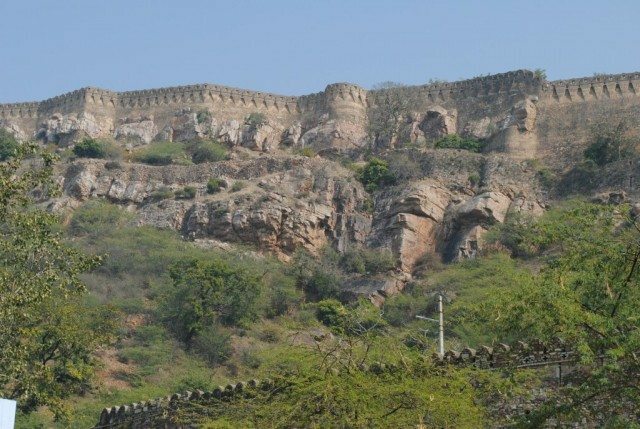 Located strategically in the hills and valleys of Aravali mountains, this fort commands immediate respect. 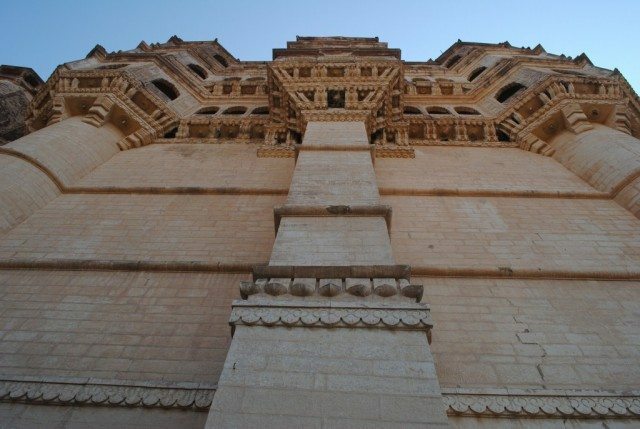 Spread over more than 12 kms, dotted with royal palaces, temples, prayer halls and surrounded by large tower and bastion studded rampart built in yellow sandstone, this fort is a fine example of Rajput fort building prowess. The light and sound show in the evening freshened the memories of several legends learnt in childhood. 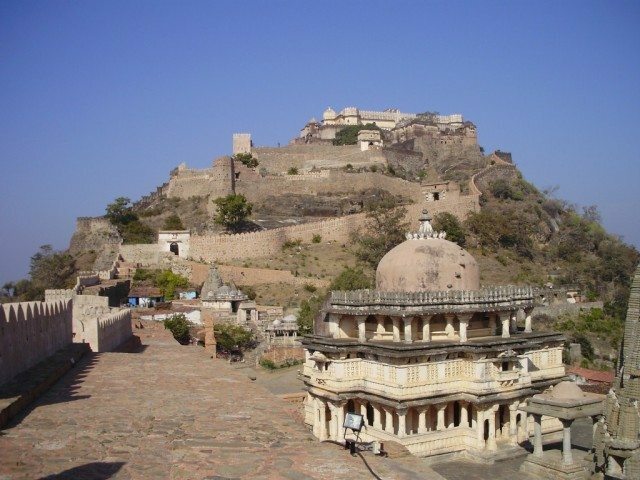 Mewar, a stronghold of Sisodia Rajputs, a sun worshipping race which came in power around 8-9’th century had their main center in Chittaurgarh. However Rana Kumbh, one of the bravest of this lineage who drove away the Sultan of Gujarat, built this fort which had been into oblivion for several centuries. Rana Kumbha was killed by his son. Several generations later a certain wet nurse carried the young Rana Udaisingh to this fort only to be confronted with the question of life and death, not her own but even more difficult, of her own child. Panna was the bravest woman in human history who saw her own child being slaughtered as she took split second decision of saving the final dangling thread of Sisodiyas. The assasins blinded by power, wanted to kill Rana Udaysinh, but Panna Dai mislead them to believe her own child as prince. What courage and what sacrifice, there is no comparison! And then finally birth of Maharana Pratap, Kumbhalgarh had a come a long way from being an obscure fort named Mandalgarh to being the pillar of strength for the Mewar kingdom. 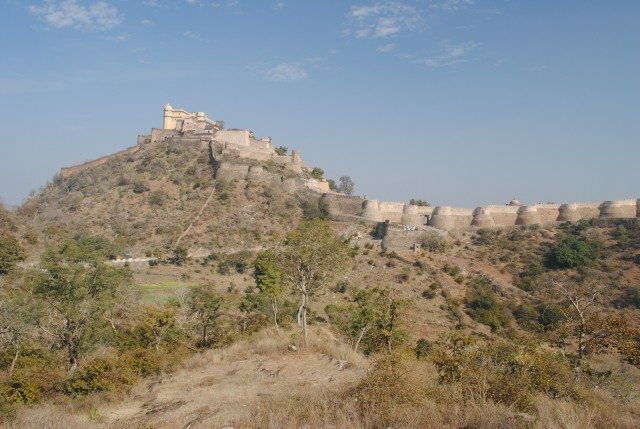 Kumbhalgarh has several points from where you can marvel at the panoramic views of wooded Aravali ranges. 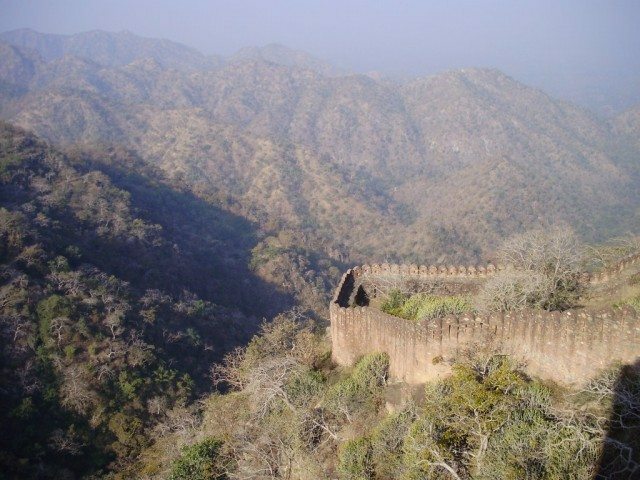 However the best spot is the highest point of the fort, Badal Mahal. Several Hindu and Jain temples adorn the landscape. Prominent among them is Nilkantheshwar temple, a strategically located ‘shiv mandir’ overlooking the valleys. The architectural style of many temples shows Solanki influence with geometric motifs and Mughal style arches. There are many other monuments, such as vedi mandir, used for making ritual ‘yadnya’, couple of Jain temples on the extreme east and sun temple in the middle, Kumbhalgarh is a wanderer’s delight. Rajasthan, the beautiful architecture in marble and sandstone, the blue sky and golden sunshine, the landscape where the mustard fields on the slopes of Aravali alternated with vast stretches of semi desert aridity, the air fragrant with memories of rich past, it was A land, not to leave but to return back to again and again! Tale of three forts, many temples, life, history and beyond. The title undersells the story so much that once you are done, you feel as if you got rewarded, multiple times. Did you catch the sound-n-light show at Chittaur ? Its really very impressive. Good article. Informative for those who have not visited and for those who have visited either. What is the significance of blue color of the houses? Wonderful. 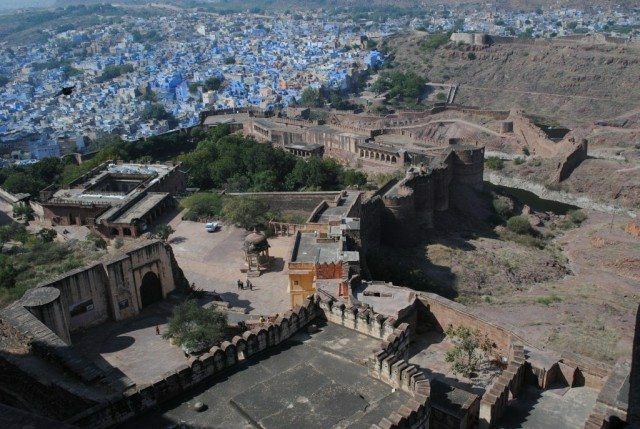 You have covered the most spectacular forts of Rajasthan. Wow Manisha,Nice one! Good writing style too.Must visit Rajasthan soon. Nandan, could not see Chittaur light and sound, must be nice. Joshi kaka, dont know about blue colour of houses, i have read somewhere it is related to the community, but not sure. Madhav, kharach plan karuya ekhadi trip barobar ! Excellent article! You should really make a compendium of all your travelogues and publish a book. Wealth of historical information and travel notes with that special personal touch. Every bit worth reading. 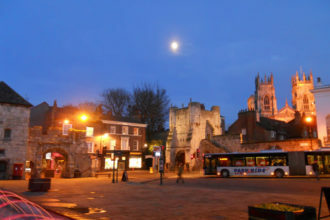 The city of York is walled and is situated on the confluence of the two rivers, Ouse and Foss. In the past, the city has been known by various names starting from the Latin name Eboracum. Anglicans later changed the name to Eoforwic in the 7th Century. Under the Danish conquest, the city became Jórvík. Once the Normans conquered it, the name was however gradually reduced to the short and handy York.